Donations to the Bright, Indiana Community. The Bright Aerea Business Association has been extremely busy in 2014! In May we conducted the Golf Outing and in the Summer we created a booth at the Bright Community Festival. These events serve 2 purposes. Members build relationships by working together to meet our goals. Volunteerism can be work, but we try and make it as fun as possible. This resulted in more volunteers and donations this year. Over $10,000 was donated to our 3 non-profits. 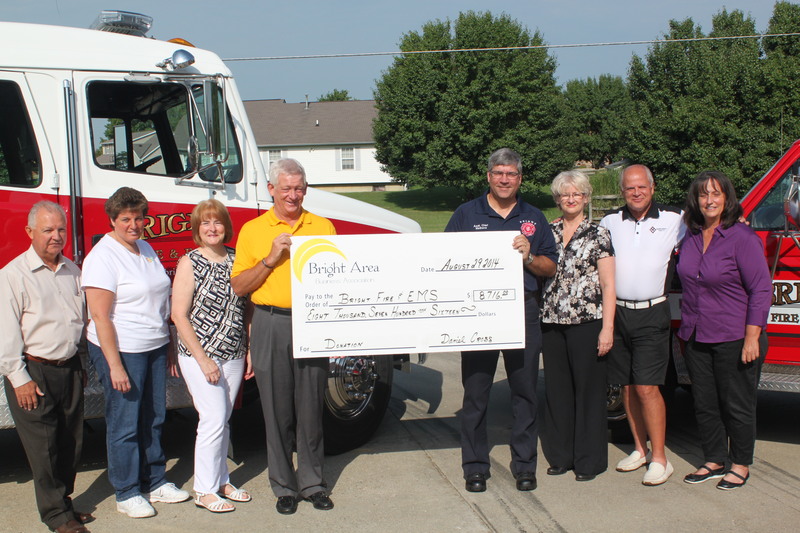 The Bright Fire Dept & EMS is important to every business and homeowner in the area. Since Bright is an unincorporated area, the department receives less Government funding. Several years ago BABA members determined that Bright Fire & EMS should be our primary recipient. 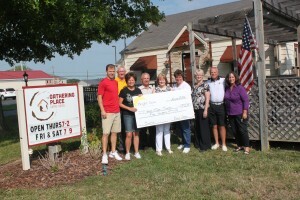 We were extremely excited to present them a “Big Check” of $8716. Thank you for keeping our homes and businesses safe! The North Dearborn Pantry is unique because it is supported by volunteers and donations; there are no paid staff. The $1000 donation from the Bright Area Business Association help the Pantry to earn $5000 in matching funds. We applaud the wonderful service they provide! Hands & Feet Ministry, Inc., provides services to those in need. They offer a comfortable place to meet in the center of Bright at the Gathering Place. They help a lot of people. Thanks go out to all the sponsors and those that donated. Hats off to our Golf Outing chair, Greg Gronwall and our Festival Chair, Diane Bender.